Figure 20.12. Prognostic role of HLC and sFLC ratios in patients achieving at least a complete response. Patients with abnormal HLC and sFLC ratios had significantly shorter 2-year progression-free survival (PFS) than patients with either HLC or sFLC ratios normal. (Courtesy of M.T. Drayson). Michallet et al. studied the prognostic value of sFLC and HLC ratios in a subset of 199 IgG and IgA MM patients from the IFM2009 trial who achieved a VGPR after consolidation therapy (by IMWG criteria). Patients with both normal sFLC and HLC ratios, or either one abnormal or both abnormal had significantly different outcomes (median PFS: not reached, 29.6 and 14.0 months, respectively; p<0.001). Similarly, Drayson et al. 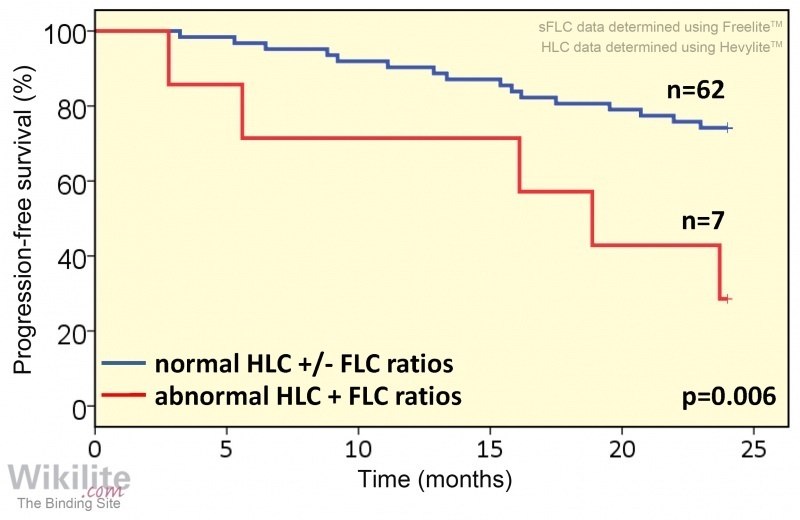 demonstrated that IgA patients achieving a CR but still having both HLC and FLC ratios abnormal (n=7) had a worse outcome than those having just one of those ratios abnormal (n=62) (median PFS 18 months vs. not reached after 25 months; p=0.006) (Figure 20.12). The authors suggested that a response category based upon normalisation of FLC and HLC ratios may be more valuable than the current sCR category of response criteria . Campbell et al. prospectively compared HLC and FLC assays with standard IMWG criteria and multiparameter flow cytometry (MFC) to assess minimal residual disease (MRD) in 23 patients who had received an autologous stem cell transplant. MFC was the most sensitive method to identify residual disease, and MFC negativity correlated with improved outcome (PFS = not reached vs. 21 months, p=0.01). However, the authors comment that MFC is challenging to implement in routine practice due to suboptimal bone marrow sampling and the need for repeated biopsies. Therefore, a ROC analysis was performed to compare the ability of HLC and FLC assays to predict MFC status. Normalisation of both HLC and FLC ratios predicted MFC negativity with a sensitivity and specificity of 100% and 82%, respectively, and the authors concluded that a HLC and FLC normalisation post-transplant is a useful surrogate marker for flow MRD negativity. What prognostic markers are used in the ISS? What is the benefit of achieving a sCR? At what MM stage can HLC analysis provide prognostic information? The ISS utilises serum β2M and albumin measurements (Section 20.1) . In a study of 445 MM patients, achieving a sCR was associated with prolonged progression free survival and overall survival compared to patients obtaining just a CR (Section 20.3.1) . Various studies have now reported prognostic information from HLC analysis at presentation, during treatment and at maximal response (Sections 20.4 and 20.5).